You can read Dr. Lustig’s important paper “The Toxic Truth about Sugar” here. A recent article in the prestigious journal Nature explains that sugar, especially fructose, widely available in soft drinks and other processed foods, is responsible for many serious non-communicable diseases, such as heart disease, cancer, diabetes, obesity, and liver failure [1,2]. One of the contributing reasons is that fructose and other high-calorie substances such as alcohol cannot be directly utilized by the body’s tissues so they must be metabolized by the liver, where they generate toxicity and set the body on a path to diabetes . Further, fructose interferes with the body’s sense of satiety, so that an excess of calories tend to be ingested. This overwhelms the liver, which then must convert the overdose of sugar into fat, which harms the liver and can lead to diabetes. Thus sugar such as fructose, when added to processed foods, has been compared to alcohol in its toxic effect. Even non-obese people are susceptible to “metabolic syndrome,” in which fructose induces hypertension, cardiovascular disease, insulin resistance, and damage to biological molecules such as proteins and lipids [1-3]. Soft drinks that contain mainly sugar, such as sodas and filtered fruit juices, don’t have enough nutrients to keep the body healthy and free from disease. They provide calories without essential nutrients that you would find in the whole fruit. These “empty” calories then replace other foods such as whole grains, fruits, and vegetables that are the main source of essential nutrients. But added sugar is not limited to soft drinks. Added fructose, as in high-fructose corn syrup or just plain sugar (sucrose, which is 50% glucose and 50% fructose), is found in a wide variety of processed foods such as breakfast cereal, juices, jellies and jams, candy, baked goods, sauces, desserts, and even ready-made dinners and processed meat. Fructose tastes sweet but does not satisfy hunger as well as more nutritious foods. The high added fructose content of processed foods is addictive in a similar way to alcohol, especially for young children. This has caused an epidemic of obesity in both children and adults. Further, the metabolism of fructose in the liver is similar to alcohol because it tends to perturb glucose metabolism, generating fat and causing insulin resistance, which leads to inflammation and degeneration of the liver and many other problems . Overall, this dietary pattern caused by overloading our bodies with fructose is a vicious cycle that leads to widespread deficiencies of nutrients such as vitamins and essential minerals, along with damage and inflammation throughout the body. This vicious cycle of sugar addiction, consistent with the “metabolic syndrome,” is in large part responsible for the high death rate from the modern diet. If the modern diet could be adjusted to satisfy hunger without excess calories and to contain a larger proportion of essential nutrients, the epidemic of disease from added sugar might be averted. When ingested in the form of fruit, fructose is less harmful because it is absorbed slowly by the gut and importantly is accompanied by essential nutrients. Supplements of essential nutrients can help, but only if knowledge about the adequate doses and their benefits is made widely available. Examples are supplements of vitamin A, B vitamins, vitamin C, vitamin E, magnesium, omega -3 and -6 essential fats, which in the proper forms and doses can help prevent dietary deficiencies that cause heart disease, cancer, and diabetes . Other lifestyle choices can help, for example, reducing total calories, increasing ingested fiber, and more exercise . But the benefits of these healthy choices have not been convincing to the modern consumer. Ubiquitous high pressure marketing of soft drinks contributes to the problem. To correct the problem of sugar overconsumption, it has been suggested that sugar be regulated like alcohol and tobacco . The goal would be to change habits to reduce consumption. Many schools have already banned the sale of sodas, but have replaced them with juices or artificial drinks that contain added sugar. According to this suggestion, the sale of sweetened drinks and processed foods containing added sugar could be limited in school vending machines or elsewhere during school hours. Age limits on the sale of sugary foods in stores might also help. A limit or ban on television commercials advertising products containing added sugar might also be helpful. A tax on sugar, especially high-fructose corn syrup, could be used to fund research into essential nutrients and advertise their benefits. The idea behind such regulation would be to persuade the public, especially children, to consume less sugar and more nutritious foods [1,2]. This could greatly benefit public health. It has been argued that similar regulation of alcohol is widely accepted because it has kept alcohol consumption under control . For example, in other areas of our lives, changes in what is perceived as acceptable behavior have been successful, like bans on smoking in public places, designated drivers who don’t drink alcohol, and the inclusion of air bags in cars. To some, a similar type of governmental regulation of sugar would seem justified because at the cost of some loss of personal freedom it could improve health and cut short the epidemic of non-infectious disease. On the other hand, many people see regulation of sugar by taxing foods containing added sugar as abhorrent and draconian. After all, although it is addictive , sugar doesn’t cause the danger of being drunk on the highway, and it doesn’t present an imminent danger to health comparable to smoking. It’s more insidious than that. And sugar has long been part of dietary habits of many cultures. Thus, any governmental regulation of food will have many critics who explain that regulation would be ineffective, and further, we should be able to purchase and eat any food according to our preference. The underlying issue in this debate is public access to knowledge about nutrition. If the harm that added fructose causes to our health could be widely publicized, along with information about inexpensive and readily available healthy alternatives, this could lead to better health for millions of people. It would cause shoppers to consider other choices, such as vegetable juice or a glass of water, along with unprocessed nutritious foods and vitamin supplements in adequate doses. What is needed is a campaign that provides practical information about diet: what nutrients we need, how to determine the proper doses, and the dangers of a processed-food diet. This could include televised advertisements and health programming, as well as curricula taught at levels from grade school to medical school. It might also include more informative labeling about the nutrient content of food, as well as more healthy and tasty food served at restaurants and dining rooms. Marketplace pressure might then convince food companies to sell more healthy food with a minimum of added sugar and an adequate content of essential nutrients. Orthomolecular medicine, the practice of treating illness by providing sufficient doses of essential nutrients to prevent deficiencies, can help to provide this information [5-8]. We can all become more healthy by forgoing added sugar and other processed foods that lack essential nutrients. And when this is impossible, we can supplement with these essential nutrients to prevent the epidemic of obesity, cardiovascular disease, diabetes, and cancer. Dr. Robert G. Smith is Research Associate Professor in the Department of Neuroscience, University of Pennsylvania. He is the author of many scientific papers, and an upcoming book, The Vitamin Cure for Eye Diseases. Lustig RH, Schmidt LA, Brindis CD (2012) The toxic truth about sugar. Nature 482:27-29. Jacobson MF (2005) Liquid candy: how soft drinks are harming Americans’ health. Center for Science in the Public Interest. http://www.cspinet.org/new/pdf/liquid_candy_final_w_new_supplement.pdf. Lustig RH. (2010) Fructose: metabolic, hedonic, and societal parallels with ethanol. J Am Diet Assoc. 110:1307-1321. Brighthope IE (2012) The Vitamin Cure for Diabetes: Prevent and Treat Diabetes Using Nutrition and Vitamin Supplementation. Basic Health Publications. ISBN-13: 978-1591202905. Roberts H, Hickey S (2011) The Vitamin Cure for Heart Disease: How to Prevent and Treat Heart Disease Using Nutrition and Vitamin Supplementation. Basic Health Publications. ISBN-13: 978-1591202646. Hoffer A, Saul AW (2008) Orthomolecular Medicine For Everyone: Megavitamin Therapeutics for Families and Physicians. Basic Health Publications. ISBN13: 9781591202264. Did you happen to see the New York Times article earlier this week about how deep decay has become such a problem for preschoolers – preschoolers! – that anesthesia is being used more often in their dental care? What makes this state of affairs so sad is that it’s so preventable. Just cutting back on sugary drinks alone would make a big difference. For instance, one study found that in communities getting improved access to good water and nutritional support, and with limited access to soft drinks, children had up to 44% fewer cavities than in non-intervention communities. Imagine the improvement if they ate fewer processed foods – especially refined carbs – as well! 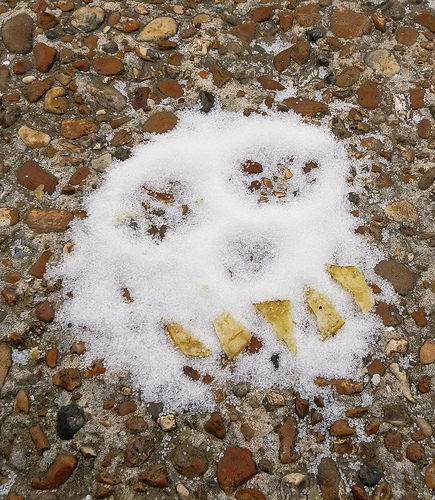 But it’s not just kids who are getting too sugared up. Lots of us eat far too much of the stuff. But since Robert Lustig and colleagues, writing earlier this year in Nature, argued that sugar should be regulated as a toxin, kicking the habit seems to have become a more popular subject to talk about…or promote a product with. Recently, I got a press release with the subject line “How to Kick Your Sugar Habit in 21 Days,” pitching a “hydration challenge” – to shift from soft drinks to water – that ultimately promotes a flavored bottled water called Hint. 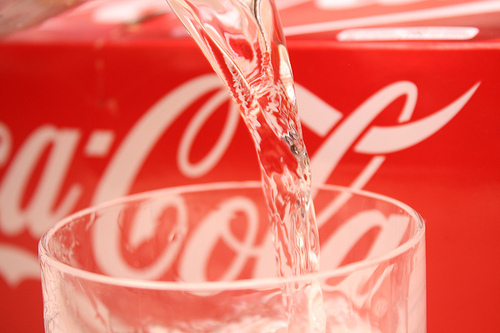 Perhaps participants will use the product to transition from soda to plain water. Perhaps they’ll love it so much, they’ll go right on drinking it. After all, this “essence water” contains no sweeteners and is calorie-free. It’s just water and “natural flavors.” Must be healthy, no? Open your refrigerator, your freezer, your kitchen cupboards, and look at the labels on your food. You’ll find “natural flavor” or “artificial flavor” in just about every list of ingredients. The similarities between these two broad categories of flabor are far more significant than their differences. Both are man-made additives that give most processed food most of its taste. Consumers prefer to see natural flavors on a label, out of belief that they are healthier. The distinction between artificial and natural flavors can be somewhat arbitrary and absurd, based more on how the flavor has been made than on what it actually contains. “A natural flavor,” says Terry Acree, a professor of food science at Cornell University, “is a flavor that’s been derived with an out-of-date technology.” Natural flavors and artificial flavors sometimes contain exactly the same chemicals, produced through different methods. Amyl acetate, for example, provides the dominant note of banana flavor. When you distill it from bananas with a solvent, amyl acetate is a natural flavor. When you produce it by mixing vinegar with amyl alcohol, adding sulfuric acid as a catalyst, amly acetate is an artificial flavor. Either way it smells and tastes the same. The phrase “natural flavor” is now listed among the ingredients of everything from Stonyfield Farm Organic Strawberry Yogurt to Taco Bell Hot Taco Sauce. So I wrote to the company to inquire about exactly what that means. I can’t access my personal email right now so I can’t copy/paste their reply, but they said something like… “We use only natural ingredients to match the flavor as closely as possibly and we take great care to make sure it’s healthy” or something like that. It sounded like a dodgy answer, but at the same time, I did get the notion that they understand that people might be concerned about it…. While the poster was “comfortable with their reply,” others pointed to a different issue: If you need flavored water, why not just make your own? It’s certainly cheaper to squeeze or pour a bit of juice into a glass of filtered water. 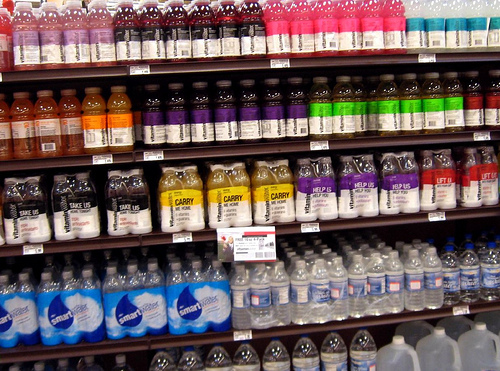 Bottom line: Yes, kicking the soft drink habit and drinking more water is an undeniable good. Your body needs water to do what it was designed to do. 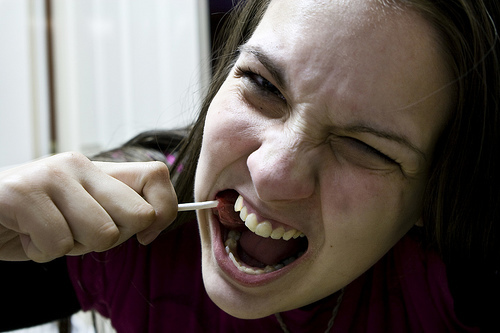 Your teeth will thank you for not feeding the microbes that cause decay. But shouldn’t consuming less of anything mean buying less? PS – I’ll be taking a short break from blogging. Regular posts will resume on Friday, March 30. So Many Sweeteners…But One That Fights Cavities? Humans have a natural like for things that taste sweet, but as anyone who pays attention to their diet knows, not all sweet things are created equal. Naturally occurring food sugars, such as those in milk and fruit, come along with a host of nutrients, while added sugars are empty calories – empty but tasty, which is why we find added sugars in so many processed foods. The manufacturers exploit our love of sweetness, even as some of the sugars they use, such as high fructose corn syrup, may have other “benefits,” as well (such as a preservative effect). Artificial sugars were made to provide the taste without the calories. But sweeteners such as aspartame (as in NutraSweet or Equal), saccharin (Sweet’N Low) and sucralose (Splenda) have long been suspected of having a negative impact on health. Researchers continue to explore what’s long been reported clinically and anecdotally. Sugar alcohols, on the other hand – sweeteners such as sorbitol and manitol – have fared much better. The only common side effects reported to date are gas/bloating and diarrhea – though you’d need to ingest an awful lot to cause them. Because they’re sweeter than artificial sugars and have low carb and low calorie profiles, sugar alcohols are also used in many processed foods. One in particular even has a role in dental health. Xylitol occurs naturally in various berries, oats and mushrooms, and it can be derived from sources such as corn fiber and wood. It’s a common sweetener for gum, as well as an ingredient in some toothpastes, including the PerioPaste I recommend to patients for tooth and gum health. This isn’t just because of the sweetness or the fact that xylitol – like all sugar alcohols – doesn’t contribute to tooth decay. Rather, xylitol appears to have special properties that may actually help prevent tooth decay. It keeps S.Mutans – one of the main microbes involved with tooth decay – from clinging to teeth. Since it can’t be fermented by oral microbes, it inhibits demineralization of the teeth. No fermentation, none of the acidic byproducts that cause caries (cavities). It reduces the growth of S.Mutans. To learn more about this remarkable substance, check out the full article. 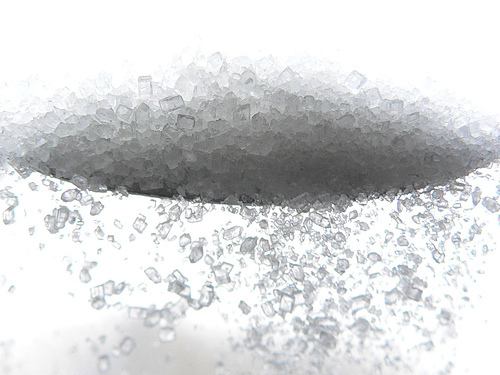 Comments Off on So Many Sweeteners…But One That Fights Cavities? Among Native Americans, tooth decay wasn’t too common before the arrival of the Europeans. Young people seldom suffered from it: it was usually associated with aging. But this all changed once the Europeans introduced white sugar and other non-indigenous foods. In general, as Weston Price showed, when communities switch from native to Western style diets, dental problems follow. Recently, I read news of a study that looked at ways of reducing tooth decay (as well as obesity) among young Native Americans by discouraging soda consumption and increasing water intake. Of course, soda – which we might just as well call “sugar water” or “liquid candy” – is one of the prime accelerators of tooth decay in many communities. Not only do soft drinks bathe the teeth and gums in sugar – a favorite food of the oral microbes whose acidic waste products cause tooth decay. The acids they contain also weaken tooth enamel, making the teeth even more vulnerable to cavities. For the Ethnicity & Disease study, the research team designed an intervention to encourage more healthful behaviors among members of a few Native American communities. To implement TOTS (“The Toddler Overweight and Tooth Decay Prevention Study”) the researchers worked closely with tribal councils. In three of the four communities, good tasting water was made readily available in water fountains and inexpensive, refillable gallon jugs. Sugared soda was removed from tribal stores, and substitution of water for soda was actively encouraged through community outreach programs. Families received food counseling and breastfeeding support through tribal community health workers. “After the successful switch to water, we compared the rate of tooth decay in children born in these three communities over the next 30 months with those born in a fourth community, where the young children had not benefited from the community interventions. We found a decrease of between 30 and 63 percent in early stage, potentially reversible tooth decay. For more advanced tooth decay the impact was smaller but nevertheless substantial. Children in intervention communities had 34 to 44 percent fewer cavities than those in the comparison community,” said Gerardo Maupomé, B.D.S., M.Sc., Ph.D., professor of preventive and community dentistry at the Indiana University School of Dentistry and a Regenstrief Institute affiliated scientist. He is the first author of the study. One of the things that caught my attention here was just how clearly this study shows how healthier environments can encourage healthier behaviors. This is, of course, the thinking behind initiatives to get sodas, sports drinks and other sugary beverages out of schools. Yet these may have only a minor effect. After all, the larger environment remains unchanged. A student who can’t buy soda at school can still buy it away from school and lives in a culture in which drinking soda is the norm. Yet we can still take steps to create and maintain positive, healthful personal environments for ourselves. And maybe our choices can serve to inspire and motivate others to value and pursue true health – something so much more profound than just the mere avoidance of sickness. Earlier this month on our office Facebook page, I posted a link to a media release debunking several dental myths. Since then, I’ve seen quite a few articles focusing on just one of them: the belief that more sugar means more cavities. A recent article in Caries Research highlights the point. Looking for links exist between snacking behaviors and caries (the clinical name for “cavities”), researchers studied the snacking habits and dental health of more than 1200 American preschoolers. Unsurprisingly, those who ate the most sweet snacks, chips and especially chips with a sugared drink had a higher rate of caries than those who consumed less of such things. The team also found that those who ate chips tended to eat more sweet snacks, including candies and ice cream. All of these foods are ones that tend stick to the teeth or, in the case of sweetened drinks, bathe them in sugars – two factors that tend to increase the length of time the teeth are exposed to sugars, and thus the opportunities for microbes to feed and excrete their cavity-causing acids. Oral problems can affect and be affected by both diet and systemic nutrition. Dental caries (tooth decay) remains the most prevalent disease of children: 7 times more common than hay fever and five times more common than childhood asthma. The mouth is an early indicator of general health and nutritional status; clinical signs and symptoms of nutritional and other health problems frequently appear first in the oral cavity. Conversely, oral problems can have profound effects on nutritional status. Emerging research is revealing even more important relationships between nutrition and oral health issues and chronic health conditions such as heart disease, diabetes, and immune-compromising conditions. Health care professionals should help their patients by asking patients about oral health concerns and referring patients for dental consults when indicated. Promoting good oral health as well as good nutrition is essential to optimal overall health status. To which we can only say, yes, exactly.